You know how every few years ANOTHER meteor crash lands on Earth to replenish the DCU's ever-dwindling supply of kryptonite, igniting a race between all the heroes and villains to obtain the shards for Superman's aid/destruction? Imagine how much higher the stakes would be if the stuff was delicious and glowed under UV light! Instructables by user BrittLiv dared to dream such a dream and has loosed a recipe for edible, glowing Superman-cide for the world to share.Tapping the UV glowing power of vitamin B2/riboflavin, the chemical and biological engineering student cooked up some rock candy infused with science (and mint oil, and green food coloring) using aluminum foil molds to create just the right crystalline shape. Of course, cooks can't count on the candy's glow for too long, as light is essentially riboflavin's kryptonite and dulls its powers over time. 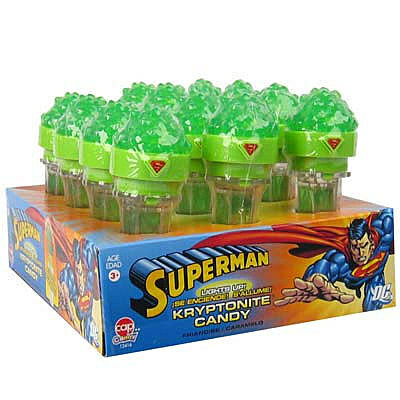 Cap Candy produced its own light-up kryptonite candy back in 2006 (likely to coincide with the release of Superman Returns), but it relied on a flashlight base to make with the glowage. Sounds kind of like a Lex Luthor solution to me. My favorite thing about BrittLiv's recipe is its flexibility. All anyone really needs to do to flesh out the entire spectrum of kryptonite colors is change up the flavor and coloring ingredients. Orange kryptonite, anyone?